The landscapes that appeal to me from a painting perspective are those that I like to spend my spare time in. 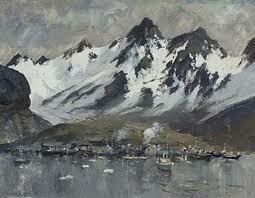 Being a keen climber and walker, I am drawn towards painting rocks and hill scenery. One of my favourite artists in this respect is William Heaton Cooper. Growing up within sight of the Lake District, his Grasmere gallery was a regular visit. I'm happy to pinch ideas from any artist if it helps me to tackle a subject, but being largely self-taught I have been influenced by those artists who have written "how to paint in watercolour" books. Along with many in a similar position, Rowland Hilders' various books have given me lots of tips. I don't attempt to ape his style (at least not consciously ) but with a recently acquired set of gouache paints I may well try to employ some of his methods rather than a more pure watercolour style. Another influential artist has been the American painter David Dewey, whose book "The watercolor book" I have found extremely helpful. Both Dewey and Hilder have the American "can-do" attitude towards art- persevere and you will have at least a modicum of success. A refreshing change from school art classes where if you didn't show early promise you were dismissed as useless. Specifically for South Georgia, and how to paint en plain air when it is very cold, I have had some useful advice given by David McEown. David is a Canadian artist who is fortunate enough to get to visit the Polar regions quite frequently, and has produced some superb watercolours on his visits. Back in 2011, I decided that, as I wasn't getting any younger, I would try to visit some of the places I have always wanted to see, and record my experiences in watercolour. The southern oceans have always fascinated me, but weren't a place I realistically could see myself visit. help was at hand, however, via the Winston Churchill Memorial Trust. Each year the trust awards a number of trvelling fellowships, of which I was lucky enough to be one of the recipients. 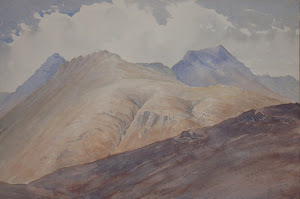 My aim is to record as much as I can of the disappearing relics of past human habitation via watercolours and sketches. Whilst the places I will be visiting are much-photographed, to capture the atmosphere in paint requires seeing it for yourself. This blog will be, like the journey itself, only part of the process. From sketches I hope to eventually produce finished artwork, but I never know what sketch will work as a larger painting and which one won't. On Sunday I fly out to Buenos Aires, then a short ferry over to Montevideo to join the ship for the start of the trip.